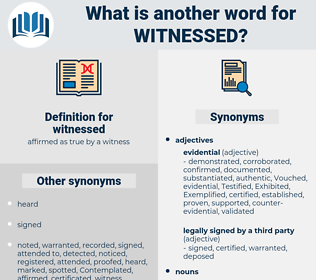 What is another word for witnessed? Testified, interviewed, noticed, noted, experienced, discovered, Caught, reported, registered, attended, perceived, Watched, missed, checked, exposed, showed, opened, Slipped, Viewed, Suffered, Stood, Enjoyed, ended, Grew, spotted, Underwent, laid, Displayed, staged, Climbed, faced, sighted, Surged, Befell, Wavered, drew, marked, Occurred, Happened, Regarded, Rallied, fixed, found, Tumbled, Looked, Talked, dipped, fell, Met, Went, posted, Jumped, Had, Rocked, Hovered. Testified, substantiated, bystanders, Existed, Investigated, demonstrated, ascertained, interviewed, Indicated, authenticated, Participated, envisioned, illustrated, sustained, Transpired, Mentioned, sat, Inspected, Discriminated, differentiated, Intervened, interpreted, precedents, represented, characterised, identified, Indicted, attested, invested, noticed, Assessed, Explained, Manifested, initiated, Benefited, Issued, Experimented, certified, acknowledged, characterized, Examined, documented, determined, evaluated, Contributed, attendance, understood, articulated, recognised, Begun, Contemplated, confirmed, assisted, Enshrined, suggested, validated, described, Attributed, outlined, noted, experienced, advised, considered, Envisaged, manufactured, discovered, appreciated, distinguished, verified, asserted, admitted, supported, Discerned, Advocated, Survived, pointed, Introduced, Caught, conceived, reported, registered, tested, spoken, proved, proven, acquainted, attended, expressed, presence, Perpetrated, committed, Confronted, informed, signed, Declined, credited, prescribed, reminded, permitted, underscored, increased, reviewed, concluded, inhabited, monitored, taped, Resided, won, emphasised, Tasted, perceived, Influenced, Exhibited, Filed, established, disclosed, renowned, Judged, recorded, Watched, owed, diversified, checked, spent, triggered, arranged, Generated, highlighted, Enabled, publicised, seeing, involved, Audited, recognized, Discussed, Passed, Encountered, Endured, Obtained, shot, Visited, learned, Learnt, Shown, serviced, Undertaken, exposed, risen, elapsed, calculated, afflicted, showed, preferred, opened, accompanied, diagnosed, attained, defined, Rendered, Arisen, accused, Entailed, Exemplified, Viewed, Notified, Sprung, Suffered, Entered, saved, revealed, Enjoyed, directed, Helped, Delivered, measured, Remitted, included, realised, recovered, ended, Surfaced, poised, expanded, Followed, Emerged, voiced, started, maintained, erupted, trained, heard, grown, weathered, detected, overlooked, expensed, Piloted, Convened, Resulted, acquired, Exercised, received, Undergone, donated, spotted, Remained, stated, known, born, Borne, decreased, realized, accepted, Incurred, Been, pronounced, turned, assumed, recommended, labeled, labelled, laid, reflected, Slowed, moved, completed, charged, satisfied, abided, Provided, Displayed, Managed, Referred, conducted, granted, accomplished, Appeared, said, iived, follow-up, obliged, driven, come, Served, Worked, faced, stored, pursued, remembered, Allowed, secured, previous, Subjected, aided, changed, Brought, sighted, given, Embarked, Caused, Gained, Accounted, studied, Embraced, Searched, Upheld, Promoted, honoured, Stayed, Succumbed, provoked, Classed, Returned, Tackled, relieved, worn, developed, ruled, become, Ticked, blown, Succeeded, bound, handled, Captured, Adhered, Evolved, Prompted, produced, Rated, drawn, Dialed, adopted, Yielded, relaxed, ravaged, Attracted, marked, accrued, Lodged, Occurred, Happened, Scored, taken, Created, fulfilled, shared, broken, raised, Deemed, Performed, Logged, respected, travelled, liked, covered, Picked, Regarded, rushed, Lived, tagged, Achieved, put, tracked, found, treated, Complied, fired, very, fallen, felt, Looked, Talked, Reached, marred, controlled, Awarded, led, called, thought, headed, held, gone, Met, based, Cared, played, Attacked, posted, ha, Flagged, have, booked, Launched, Had, Gotten, Got, kept, Rocked, founded, formed, Dealt, tried, run, Meant, done, made. gather, seem, hear, appear, catch, guess, have. demonstrates, certifies, experiences, attends, suffers, stands, hears, knows, turns, seems, appears, performs, finds, VU, Has. This function is of rare use; I know grown Samoans who have never witnessed it. And then began the most curious conversation I have ever witnessed.